Since 1949, AFM has provided brokers and clients with the financial strength they need to stay confident in an ever-changing market. 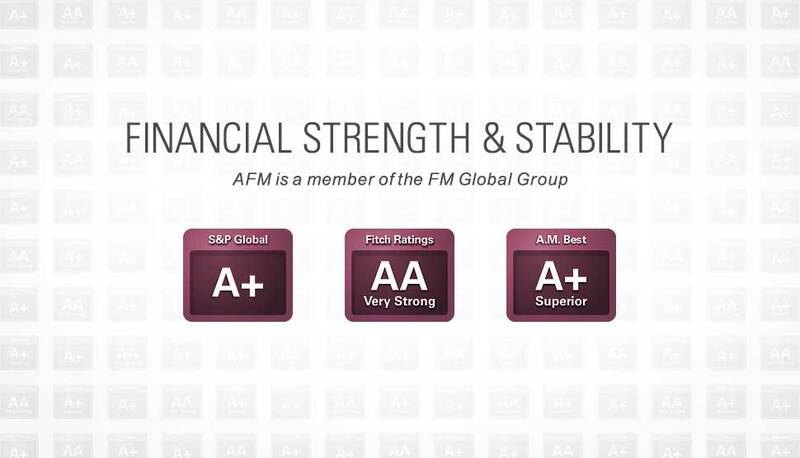 As a member of the FM Global Group, AFM maintains an A+ rating from AM Best, a AA rating from Fitch, and an A+ rating from S&P Global's rating services. Our time-tested business model has proven to be resilient in the face of market volatility. We've maintained stable capacity through the ups and downs of the global market. We have grown with our clients over the years to become a global presence in middle market property insurance. Our extensive knowledge of the global landscape, access to FM Global's WorldReach® network and unique policy structure put us in a position to help clients expand internationally and cater to growing markets around the world. FM Global was named the best insurer for property and boiler and machinery in National Underwriter Property & Casualty magazine's 2017 Risk Manager Choice Awards and ranked #112 on Forbes magazine's 2017 Americas Best Employers list.